Hand-tied bouquets allow the flowers to shine in a round, gathered arrangement, but the stems also participate in the traditional brid al look as ribbon-wrapped handles of beauty. 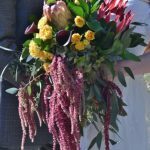 The result is a tightly cluster round of flowers with a little something extra underneath, such as satin ribbon wrapping or a handle that trails lengths of ribbon or lace. 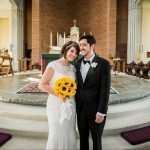 The hand-tied bouquet can be either formal or informal, depending on the types of flowers you choose and the combination you create. The most commonly used flowers in hand-tied bouquets are roses, ranunculus, calla lilies, tulips, phlox, and peonies. These so-called sturdier flowers with thicker or stronger stems will hold the weight of a flower head and keep the shape of the bouquet. Smaller flowers such as lilies of the valley, Queen Anne’s lace, and Bells of Ireland are often added to give a delicate touch of balance out a collection of big, dramatic blooms. 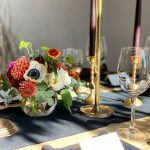 Hand-tied bouquets are also referred to as clutch bouquets, and you can design them to have the entire stem wrapped in ribbon or just tie the stems with ribbon directly under the flowers, leaving the natural green stems exposed. This effect gives your bouquet a just-picked-from-the-garden look. Pastel flowers stand out in a hand-tied bouquet when you add plenty of greenery. 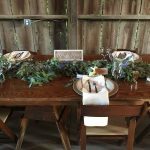 Mixing flower varieties allows you to change the formality level. 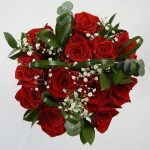 Daisies and tulips are less formal, while roses and calla lilies are more formal. 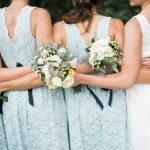 A pastel color scheme allows you to complement your bridesmaids’ dresses or the wedding décor for a more unified look. 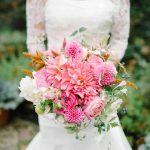 Bright red bouquets are perfectly fine for day-time weddings, so don’t eliminate this color choice just because your wedding takes place in the afternoon. 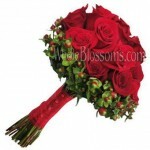 Passionate, lipstick red roses are the top choice in this style of bright bouquet. Select a range of reds and add even more depth by selecting flowers in a cranberry color. Reds are almost impossible to match perfectly in hue, so eliminate any clashing tones by purposefully choosing a collection of bright and deep reds. 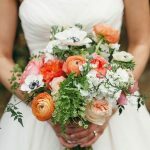 Orange is a bright, happy color substitute for spring, summer, and fall weddings, which makes for hand-tied bouquets. Again, greenery brings out the natural look of the hand-tied bouquet’s stem and provides the perfect top and bottom color accent to make a tangerine floral cluster pop.